Mark Rayner shows you how to create this simple plant display from an old window frame. It’s perfect for potted colour or a selection of your favourite herbs. You will need: A clean cloth, drill with small drill bit, four cup hooks, four plastic plant pots, old wooden window frame, paintbrush, sandpaper, scissors and thick garden twine. Resene Quick Dry and Resene Lumbersider, tinted to Resene Gin Fizz. Top tip: If the original paintwork is dirty, wash with a solution of one part Resene Paint Prep and House Wash to three parts clean water. 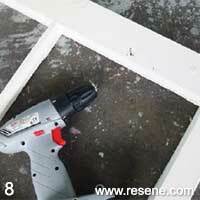 If wood is in poor condition, fill any holes or cracks with an exterior filler before sanding. Use cup hooks that are suitable for exterior use. 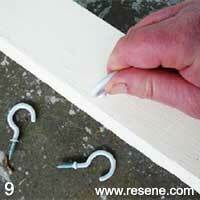 Alternatively, you could also use galvanised flat head nails instead. To get the look: Mark painted the background wall with Resene Lumbersider, tinted to Resene Pale Prim and the table with Resene Enamacryl, tinted to Resene Woodstock. Lightly sand the window frame to remove any loose paint and “key” the surface, then wipe off any sanding residue with a clean cloth. 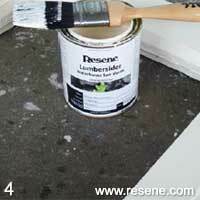 Spot prime any areas of bare wood with Resene Quick Dry and allow to dry for two hours. 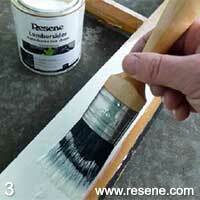 Apply one coat of Resene Gin Fizz to the entire window frame and allow two hours to dry. 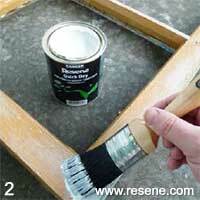 Apply a second coat of Resene Gin Fizz to the window frame and allow two hours to dry. 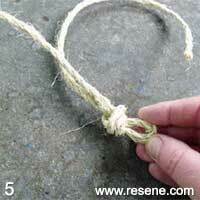 Cut a 50cm length of garden twine and tie a loop in the centre, as shown. 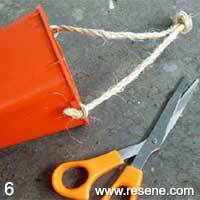 Attach the looped piece of twine to the first plant pot, knotting each end through the label slot on either side, as shown. 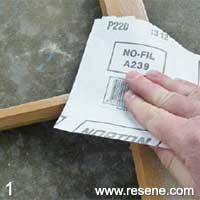 If your plant pots don't have label slots, simply drill a small hole through each side. 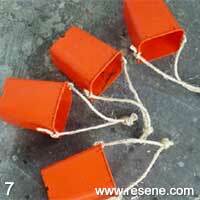 Trim ends of the twine, if necessary. Repeat steps five and six with the three remaining pots. Drill four small, central pilot holes above each 'pane' of the window frame. Carefully screw a cup hook into each hole. 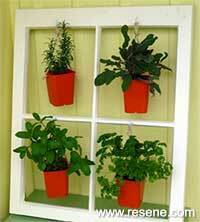 Lean the window frame against a wall and hang a planted pot on each hook.